Blame it to inavailability of stock, there was none left on the shelf when I asked the sales clerk for my favored brand of moisturizer, driving to the other mall was so impractical given my hands-full circumstance, the least I can do at that time was to find an alternative or I’ll go home empty handed. So I moved on to the next wall of facial products, wondering why there were so many of them and that choosing was as difficult as someone who can’t read a line but I eventually run my fingers on the labels and decided to pick this Celeteque DermoScience+ Hydration Facial Moisturizer. I was so attached to my previous brand hence my hesitation, but I thought I’ll give this one a try. They say love can happen in a most unexpected situation, well then, in this case, I have to affirm that this theory is true. After a week of using, I can assure you it lived up to its 4-point label promise. The strongest point is its hydrogel formulation that is so easy to apply with no grease-feel at all. The rest is trust that this product will deliver. So, ‘I love it na’. 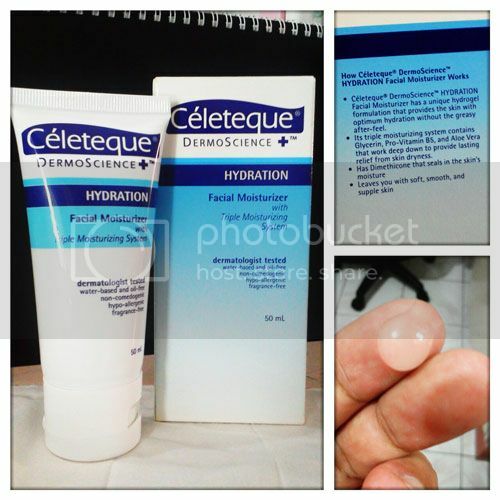 Celeteque is a product of Innovitelle, Inc. a subsidiary of United Laboratories, Inc.
What’s your brand of moisturizer, ladies? It would be nice if you can share it with me in the comment section below. Thanks for dropping by.